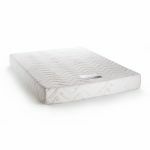 The top of our Chalford range, this super king-size not only boasts a huge and comfortable sleeping surface, but also the latest in sleep technologies from Leggett and Platt. With us, you know you're getting the most luxurious sleep experience. The core is comprised of more than 2000 of Leggett and Platt's innovative 15 cm pocket springs. 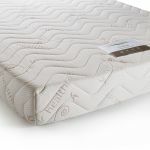 The springs provide individual support to each sleeper, as wrapped in a fabric sheath they move silently and independently, truly moulding to your unique shaped. 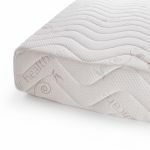 Encapsulated in a high resilience foam casing, the mattress features edge to edge support which not only makes the sleeping surface feel bigger, but also helps to extend the life of the mattress. Topped by luxury comfort foam, and a micro-quilted knit stretch cover for added cosiness, this mattress is a snuggly dream to sleep on. 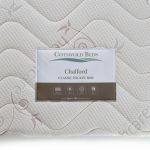 Bring only the best into your bedroom with our Chalford 2000 super king-size mattress!